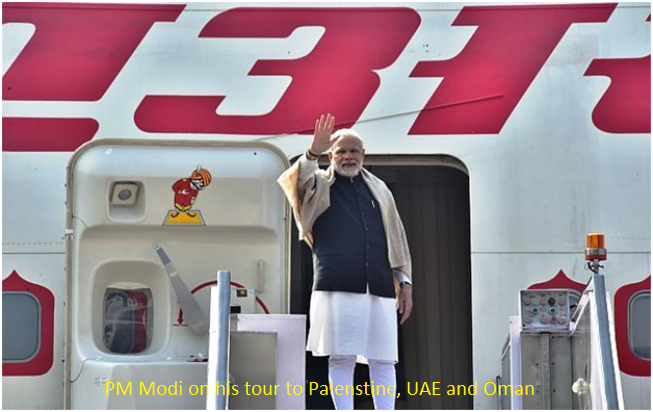 Following is the text of the Prime Minister, Shri Narendra Modi�s departure statement prior to his visit to Palestine,United Arab Emirates and Oman. �I will be undertaking bilateral visits to Palestine, United Arab Emirates and Oman from 9-12 February. I am happy to visit the Gulf and West Asian region for the fifth time since 2015. This region is a key priority in our external engagement. We enjoy vibrant multi-dimensional ties with the countries here. The visit will begin from Palestine, on 10 February after transiting through Jordan. I am grateful to His Majesty King Abdullah II of Jordan for facilitating the transit. I look forward to meeting him in Amman on 9th February. This will be the first ever Prime Ministerial visit to Palestine from India. I am looking forward to my discussions with President Mahmoud Abbas and reaffirming our support for the Palestinian people and the development of Palestine. I will visit UAE on 10-11 February, where I am returning after my visit in August 2015. UAE is a valued strategic partner with whom we have fast-tracked cooperation in all major spheres including economy, energy, high technology and security. I will be discussing our progress in these areas and more in my meetings with His Highness Sheikh Mohammed bin Rashid Al Maktoum, the Vice President and Prime Minister of UAE and Ruler of Dubai, and His Highness Sheikh Mohamed bin Zayed Al Nahyan, Crown Prince of Abu Dhabi. At the invitation of the leadership of the UAE, I will be addressing the 6th edition of the World Government Summit in Dubai, where India is the Guest Country of Honour. On the same day, I will also engage leading UAE and Arab CEOs in Dubai on the vast economic opportunities in India and what more can be done together to bolster business collaboration. Oman is a close maritime neighbour with whom we enjoy excellent relations. I will hold talks with His Majesty the Sultan of Oman and other key leaders. I shall also interact with leading businesspersons of Oman on developing stronger economic and business links with India. Oman is a close maritime neighbor with whom we enjoy excellent relations. I am delighted to undertake my first visit there as Prime Minister on 11-12 February. India and Oman have thriving links rooted in centuries old people-to-people exchanges. On the evening of 11th February, I will be meeting His Majesty the Sultan of Oman. I will also meet Deputy Prime Minister for the Council of Ministers HH Sayyid Fahd bin Mahmoud Al Said and Deputy Prime Minister for International Relations and Cooperation Affairs HH Sayyid Asa'ad bin Tariq Al Said. We will review bilateral cooperation and steps to further enhance our traditionally strong links. On 12th February, I will interact with leading businesspersons of Oman on developing stronger economic and business links with India. In both Oman and the UAE, I will have the opportunity to meet the large Indian diasporas that have made those countries their home. More than 9 million Indians work and live in the Gulf region, of which about one third live in the UAE alone. In Oman, they constitute the largest expatriate community. The Indian diaspora is a bridge of friendship between India and the Gulf states. They are also active participants in the prosperity and progress of their host countries.